Join the discussion on our forums! Come discuss Dire Mole over in our dedicated Dire Mole discussion topic. You especially don't want to make a dire mountain out of a dire mole hill. Y'know this card is legitimately good in a buff paladin deck because, even 1 buff on this card can make this a 4/3 on turn 2 or a 5/5 on turn 8/3 on turn 2 if you have the coin. 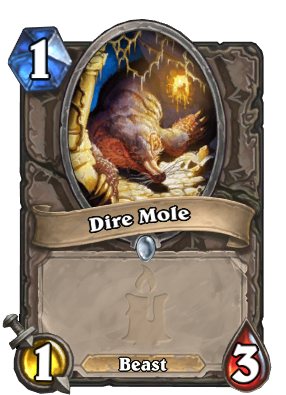 This can easily win you the early game or force out your opponents hard removal after punching them in the face with your "10/10 meme mole". Anyone else bothered by the low-ress art of this card? Death Knight Rexxar says thanks. Whoever tried to build an "ideal" beast hunter deck lately knows that the deck needed 2 one drop as alternative play to alley cat for consistency + a couple of other good cards, I wonder if these + maybe flanking strike will do the trick and bring back the deck. I think this card may actually be one of the strongest cards in the set. A 1/3 on turn 1 is something Aggro Druid and Hunter decks would love to run but have not had the means to do so. Combos extremely well with Crackling Razormaw in Hunter, which previously had to rely on drawing one of its only 1 drops in the deck, Alleycat. That opener is the current staple of Hunter. In the same instance, Aggro druid have Enchanted Raven on turn one that they really wanna buff with Mark of Y'Shaarj. This card really helps the consistency of those decks with getting the ideal curve on the most important turns. This is a great Glaivezooka target for wild hunter. Why is everyone talking about hunter? This could very well be as effective as Enchanted Raven in aggro druid. Funny fact : The only card in the set with no text on it. And the only one we know for sure that will be played. Aggro Druid like it too. Aside from a great 1 drop, it's (to me, anyway) a pleasant buff to Build-a-Beast, being able to tackle on a little extra health so cheaply. Build-a-Beast got some dope new effects. Nice to see a couple cheap beasts to build some affordable ones.